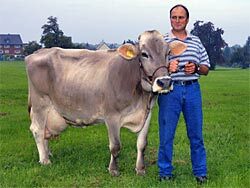 The Sum of the positive characteristics has lead to a steadily rising numbers of farms using Brown Swiss sires in crossbreeding with other dairy breeds. According to a press release, the present world record holder for lifetime milk production has been put down on May 5, 2010. Morchel spent her lifetime on the farm of the Studach family in Moerschwil, at a 10 minutes drive from the city of St. Gallen. She last calved on August 20, 2006, with a heifer calf by Bruget, and her last test on April 26, 2010 was 6.0 kg. Morchel goes back to Rapture El Regal, from a dam sired by Johann Proud Matthew (W) with a lifetime production of 74398kg or 164019 pounds, then a cow sired by Darwin, a Beautician (A) son, and after that original Braunvieh. Hats off to the Studach family and a special thank you for proving the longevity, productivity and sturdiness of our breed! A new world record production in milk, fat and protein has been set by Lost Elm Prelude Pixy ET. Click here to view a PDF.